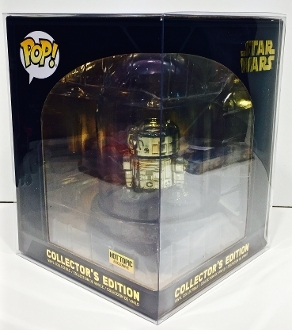 1 box protector for the Funko Gold R2-D2 Collector's Edition Hot Topic Exclusive! These do NOT fit the BB-8 that came out earlier but we do have that size also! This may also be a decent, but not perfect, fit for the Enchanted Rose but please check your size to make sure it will work for you. This protector is 9 11/16 x 7 11/16 x 7 5/8 or roughly 24.6 x 19.6 x 19.3cm. 14mil .35mm acid free PET plastic.